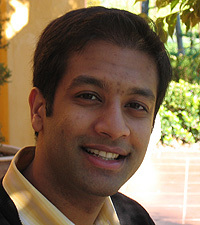 Samit Dasgupta, assistant professor of mathematics. 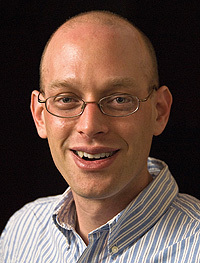 Mark Krumholz, assistant professor of astronomy and astrophysics. Photo by J. MacKenzie. The Alfred P. Sloan Foundation has selected two UC Santa Cruz faculty members to receive 2009 Sloan Research Fellowships: Samit Dasgupta, assistant professor of mathematics, and Mark Krumholz, assistant professor of astronomy and astrophysics. The prestigious Sloan awards are intended to support the work of exceptional young researchers early in their academic careers. This year, the foundation awarded a total of 118 fellowships to researchers in the fields of physics, chemistry, computational and evolutionary molecular biology, computer science, economics, mathematics, and neuroscience. Each award includes a $50,000 grant that provides unrestricted support for research over a two-year period. Dasgupta's research in mathematics focuses on number theory and arithmetic geometry. Specifically, he studies the connections between special values of L-functions, algebraic points on Abelian varieties, and units in number fields. Krumholz is an astrophysicist whose research focuses on star formation and the interstellar medium, with particular emphasis on the formation of massive stars, the structure and evolution of molecular clouds, and global regulation of star formation in galaxies. The Alfred P. Sloan Foundation is a philanthropic, not-for-profit grant making institution based in New York City. Established in 1934 by Alfred Pritchard Sloan Jr., then president and CEO of General Motors, the foundation makes grants in support of original research and education in science, technology, engineering, mathematics, and economic performance.